On November 30 at 1430 UTC, GOES-16 began it’s drift from the checkout position at 89.3W to the GOES-East position at 75.2W. Starting around 1330 UTC, the ABI, EXIS, GLM, SUVI, SEISS instruments have been placed in safe or diagnostic modes with no data capture or distribution. The satellite will drift east at 1.41°/day until it arrives at it’s new position on December 11. Data collection and distribution will resume sometime between December 14-20. At that time, GOES-16 will officially become GOES-East. GOES-16 ABI imagery will no longer require the “preliminary, non-operational data” tag! GOES-13 (current GOES-East) will drift to 60W during the period of January 2-22. The final GOES-16 full disk images from the checkout position are below (Fig 1). For more detailed information on the drift plan, visit: http://www.goes-r.gov/users/transitiontToOperations.html. After GOES-16 comes back online, the data will then be available in the “East Full Disk/CONUS/Mesoscale” AWIPS menus (instead of “Center” menus). Additionally, the GOES-East portion of the blended GOES East/West imagery products (located at the top of the “Satellite” menu in AWIPS) will be missing once GOES-13 moves in January. Procedures will need to be updated to account for these changes. An impressive upper-level trough brought significant snowfall to the Rocky Mountains on 17 November 2017. The storm system accelerated east through the evening and deepened a surface low and associated cold front. Convection developed along this front already during the morning of the 18th, including a few early day severe storms. Storms were developing within an SPC slight risk and severe thunderstorm watch, the main threat being damaging wind gusts. The progression of the upper level trough is diagnosed in GOES-16 water vapor imagery. Entering northwest Colorado at the start of the loop, the shortwave accelerates southeast through the state into the Texas Panhandle and then east into Oklahoma by the end of the loop. Convection initiates at the end of the loop along a cold front ahead of the main shortwave energy. Convection developed within the bounds of the default mesoscale sector 2, so no request was made. It is recommended that offices still make a mesoscale sector request even if the phenomenon is in a default sector, as other requests could move the sector. 1-min visible imagery from early in the day shows the development of strong-to-severe storms along the cold front heading towards Indianapolis. An early season winter storm brought accumulating snowfall to southern Colorado on 7 November 2017. While the mountains experienced the greatest snow accumulations, parts of the plains near and west of I-25 measured over an inch, with mainly less than an inch falling east of the I-25 corridor. GOES-16 data provided some helpful insights into this system. 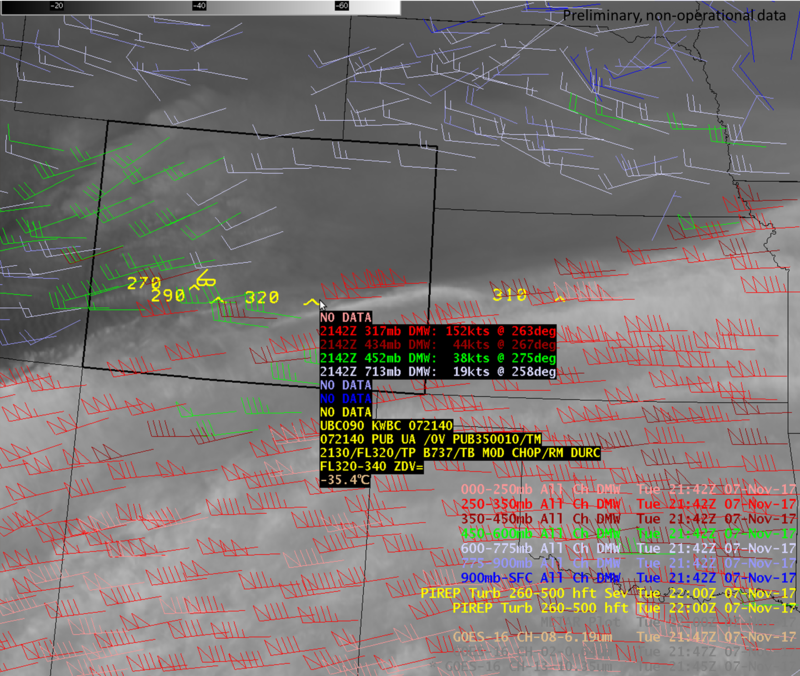 Water vapor imagery captured the impressive shortwave trough as it approached and moved over southern Colorado. The shortwave can easily be identified as the dry/warm slot in the flow (with clouds developing to its northeast). Additionally, the core of the upper-level jet is identified in water vapor imagery as a sharp south-north transition to warmer temperatures (dryer atmosphere) over the southern part of the state. GOES-16 Derived Motion Winds also highlighted the exceptionally strong jet over the region, with some winds measuring to 150 knots around 300 mb. Aircrafts reported moderate turbulence in the area at that level. Finally, the GOES-16 nighttime microphysics RGB highlighted the bands of snow versus liquid clouds. Since the snow bands have ice, the green component (fog difference) will be less. Additionally, these clouds are slightly colder, leading to less of a blue component. Therefore, the clouds containing snow will have more of a red/orange tint compared to the liquid low clouds which appear ~light green. The upper-level cirrus clouds speeding by in the southern part of the scene appear deeper red to black. Severe storms impacted the Ohio River Valley region on 5 November, with an SPC Enhanced risk for severe spanning from southwest Illinois into East-central Ohio. Convection developed along a southward moving cold front, south of which strong southerly flow was drawing up very moist air (surface dew points into the upper 60s). The abundant low-level moisture and southerly flow combined with cold temps and strong flow aloft led to favorable instability and deep layer shear across a broad region. All severe hazards (hail, wind, tornadoes) were expected with this event. Prior to the event, products from GOES-16 revealed valuable information about the pre-storm environment. 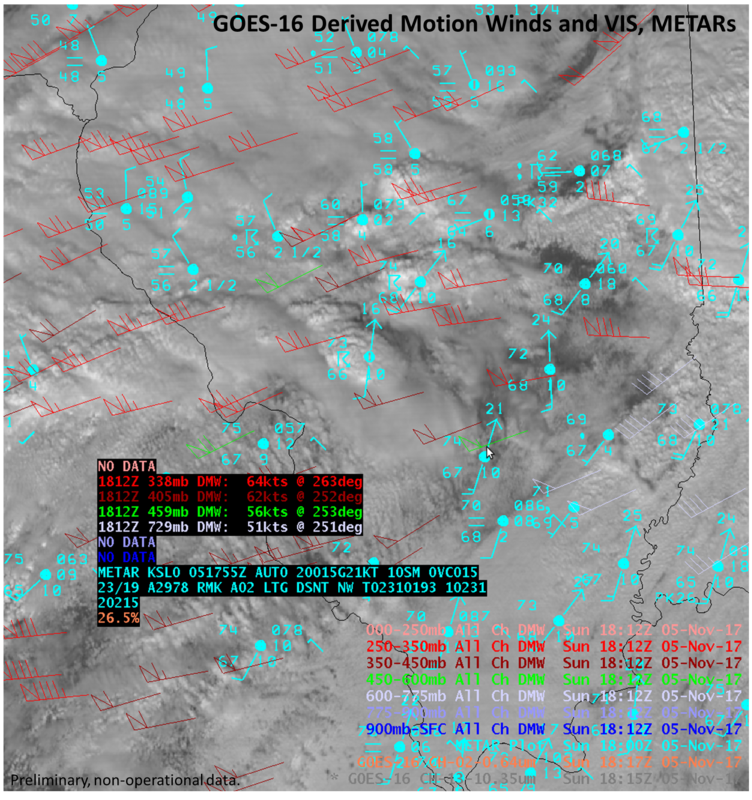 The GOES-16 Derived Motion Winds, combined with surface METAR observations, allowed for the computation of observation-based deep layer shear (Fig 1). Around 1800 UTC in southern Illinois ahead of the cold front, KSLO measured surface wind speed to be 15 knots from 200 degrees. Directly over the METAR, satellite-derived winds at 459 mb were 56 knots from 253 degrees. This computes to a 0-459 mb (close to 0-6 km) bulk shear of 48 knots, which is more than adequate for supercell storm development. The cold front can be diagnosed in the surface obs at this time in central Illinois. GOES-16 1-min imagery was available over the region for this event. The VIS/IR sandwich combo, described in previous posts, provides a combination of high resolution imagery (0.5 km VIS) with quantitative information (temperatures from 2 km IR). The animation below shows the sandwich combo with a tornado-warned storm in southern Indiana. Overlaid is NLDN CG lightning data and NWS warning polygons. A little later, severe storms had developed all along the cold front from east-central Missouri through Illinois. Again, the GOES-16 VIS/IR sandwich combo allows one to quickly diagnose important features and phenomena such as overshooting tops, above-anvil cirrus plumes, enhanced-V signatures, and new convective development (Fig 3.). As the sun set on storms over Ohio, gravity waves were obvious emanating from overshooting tops. These storms produced wind damage and were associated with multiple tornado warnings. A dry cold front pushed south down the eastern Colorado Plains and western Kansas during the evening of 4 Nov into the early morning hours of the 5th. The push of cold air is captured nicely in GOES-16 IR Window channel imagery (Fig. 1). Additionally, the hourly-updating GOES-16 Land Surface Temperature product shows the cooling surface temperatures (in clear sky areas) behind the cold front (Fig. 2). A mountain wave event impacted Colorado on 4 November 2017. A 100+ knot, westerly upper-level jet developed over the state during the night of the 3rd into the morning of the 4th. The strong winds aloft quickly mixed to the surface as the mountain wave took shape over the eastern mountains and adjacent eastern plains. A high wind warning was issued for the Palmer Divide south to the New Mexico border for the eastern mountains and adjacent plains for wind gusts up to 60 mph. Numerous reports of winds in excess of 60 mph were recorded. GOES-16 provided unique views of the mountain wave clouds associated with this event. Lee wave clouds set up over eastern Colorado early on the 4th as the strong westerly flow interacted with the north-south oriented mountain ranges. These clouds are identified in GOES-16 10.3 um IR imagery as stationary and are relatively cold compared to other clouds in the region (Figure 1). The three water vapor channels from GOES-16 show expected subsidence immediately upstream from the wave cloud (warmer region; Fig. 2). Additionally, one can diagnose ripples, or small wavelength waves, in the clear air moisture fields, as well as on the top of the wave cloud at times. These features indicate potential turbulence for aircraft pilots. The 0.64 um, 0.5 km VIS shows the ripples atop the wave clouds, along with the wave clouds themselves, with much more spatial detail (Fig 3). The 1.3 um channel, which is sensitive to water vapor absorption in the lower atmosphere (where most of the moisture resides), highlights the mid/upper-level wave clouds clearly atop the dark background and other, less reflective clouds (Fig 4). The 10.3 – 3.9 um difference also distinguishes the mountain wave clouds during the daytime. The reflectance of solar energy off of the small ice particles in the cloud (in addition to the longwave emission component) results in a warmer temperature in the 3.9 um channel versus the 10.3 um IR window, and therefore relatively high negative values when taking the difference.